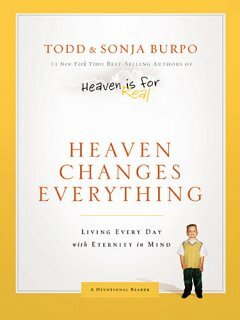 If you’ve read and enjoyed Heaven is For Real by Todd Burpo, you’re going to love Heaven Changes Everything. Todd and his wife, Sonja, team up on this devotional book based on Heaven is For Real. If you didn’t read the first book, it is the account of a young boy who became gravely ill and visited heaven. The devotional is able to be read as a stand-alone volume, although the examples mentioned are richer if you’ve read the companion book. It is important for Christians to live their lives with a view of heaven in mind. So many things are easier in this life when seen in light of eternity. Todd and Sonja both contribute short chapters dedicated to different topics related to life beyond the veil. Taking a heavenly perspective gives us the ability to endure and to encourage in ways that nothing else can. It is easy to fall into discouragement when we find ourselves failing at something again and again (or to be judgmental when we watch as someone else tries and fails repeatedly). God doesn’t look at it that way. He doesn’t grow impatient. Instead, He watches us and encourages us like a parent of a child who is learning to walk. As parents, we know our child will fall but we feel nothing but elation when they try. When they fall we don’t scold them. Instead we pick them up and set them up to try again. Some children are slower to walk than others. As their parent we don’t love them any less. They are living up to their potential and we are pleased with that. God only asks that we do our very best, not that we always succeed. Heaven Changes Everything takes subjects like family, death, forgiveness and grace and illustrates them in light of our eternal destination. The short chapters are easy to read and are perfect for a daily devotional to reorient ourselves away from the temporal concerns of this world and towards a heavenly perspective.